Apple TV is said to be a magic to make you more accessible to all the media content on your HDTV via its powerful AirPlay streaming feature. Thus, you could watch movies videos and listen to music all around the house via Wi-Fi or home network connection. That being said, this doesn't mean you can stream any movie video audio to Apple TV (4), for Apple TV (4) puts strict limitations on the video audio formats it supports. Hence, prior to stream media from Mac/PC to Apple TV (4), it's advisable to make clear on what Apple TV supported formats are. Below the list of file formats playable on Apple TV will help you get better know about Apple TV formats. MacX Video Converter Pro - 83X faster speed to convert 3D Blu Ray (MTS, M2TS), MKV, AVI, FLV, WMV video to Apple TV (4) supported formats (MP4, MOV, M4V, AAC, MP3, AC3, WAV and more) with intact quality on MacBook, iMac 4K 5K (macOS Sierra supported). How to Make DVD Movie Blu Ray MKV FLV Video Viewable on Apple TV (4)? The video audio formats Apple TV supports are listed already. In case you wanna play DVD movies on Apple TV (4) or watch MKV FLV AVI WMV Blu Ray (M2TS, MTS) video on Apple TV, you are suggested to convert DVD or video to Apple TV compatible formats (MP4, MOV, M4V). 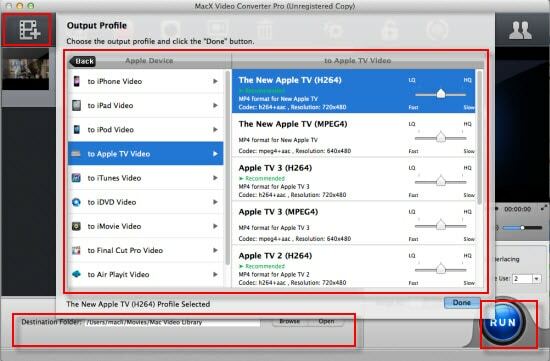 To stream video to Apple TV with unsupported video format, first thing first, you ought to convert video to Apple TV friendly formats with a feature-rich video converter for Apple TV. Among the truckloads of video converter software, the award-winning MacX Video Converter Pro is out of the bunch. Built in 320+ video and 50+ audio codecs, this all-in-one video converter for Apple TV enables you to convert Blu Ray video, MKV, AVI, FLV to Apple TV accepted MP4 MOV M4V with 83X faster speed and zero quality loss. And if you wanna download and convert video to iPhone X/8/7/6s/Plus, iPad Pro, iPad mini 4, Android device, it will meet all your needs, as well, with 350+ preset profiles provided for you to choose. 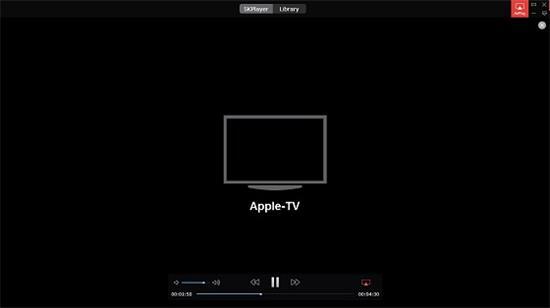 With intuitive interface, you can make video to Apple TV (4) conversion task finished just a click away, no matter you are an expert or a newbie. To stream DVD movie to Apple TV, what you need is a professional yet powerful DVD converter for Apple TV. Here the cutting-edge MacX DVD Ripper Pro is highly recommended since its preeminent DVD decryption ability would aid you to remove any DVD copyright protection tech, irrespective of CSS, Region Code 1-6, RCE, UOPs, or Sony ARccOS, Disney X-project protection; and then hassle-free rip and convert DVD to Apple TV supported format, be MP4, MOV, or M4V with nary a loss in DVD quality. Only 4 simple mouse clicks, you can accomplish the whole DVD to Apple TV accepted video format conversion. Followed by DVD movie streaming to Apple TV (4) from Mac/PC Windows and then you can eventually play movies on Apple TV for family watching. 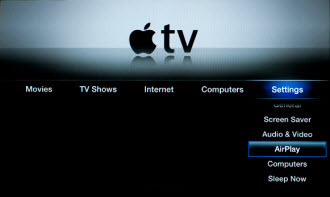 To AirPlay media content from Mac/PC to Apple TV, the common way is to get assistance from iTunes. Providing you don't want the troublesome iTunes' involvement, it's advisable for you to have a try on the much easier 5KPlayer whose mighty AirPlay feature will aid you to effortlessly stream DVD video from MacBook/iMac/Windows 10/8 to Apple TV 4 without iTunes participation. And the whole process is not needing the slightest effort. Step 1: Free download 5KPlayer on your Mac (to AirPlay Windows PC to Apple TV, go to the windows version of 5KPlayer) and launch it. Please make sure that your Apple TV, 5KPlayer and your computer are in the same Wi-Fi condition or network connection. Step 2: To AirPlay DVD/video from Mac to Apple TV, click AirPlay button on the top right corner on the interface and then the airplay receivers will pop up. Choose Apple TV. The AirPlay button will go red if it is enabled. Step 3: Add DVD movie, video you want to stream through Apple TV AirPlay. This media streaming player will start to stream to Apple TV instantly. And the DVD video streaming mission doesn't cause any effect on your other tasks so that you can also do other things on computer, like browsing the web, visiting Facebook, etc.